A couple of weeks ago, I bought what in my opinion is the queen of Nikon lenses. The Nikkor 50mm f/1.4 is my first fixed lens - which I always thought were for grown-ups - and I'm still getting used to it. I've been spoilt by the choice a zoom lens offers - with this lens I have to move a little more which is a great way to learn more about composition. Whilst I find myself bopping my head back and forth like a chicken, the results are best described as graceful. For my non-photographer friends, a lens with these credentials, of a low f stop and Nikon quality, would cost thousands of dollars. For some reason, this particular one - which not so different in quality especially for non-professionals - is probably the best value for money out there. I love it and highly recommend it. The Gardenia took a break last year and didn't flower at all. There were a couple of attempts but they were pathetic. This year, it made up for last year - and I think it's probably warning me the next year is another break! The scent of these flowers is out of this world. The plant, with and without flowers, always looks beautiful. i don't know much camera lens, but i do know that pics are beautiful. the flowers remind me of jasmine. do u agree with me ? Wow. It may be the lens or your ability to shoot or the combination. Bokeh looks great and the color rendition is excellent. Good choice of subject Bu! Oh! 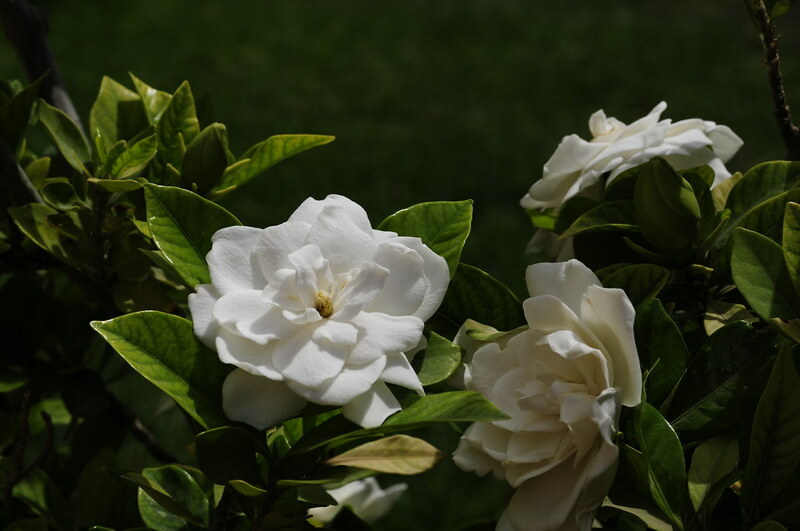 Gardenias! Reminds me of being young again, and going to dances, and corsages! Oh the smell is so wonderful! Lucky lucky you! Nice photos, too, but LOL, oh, the smell! looks so pretty! 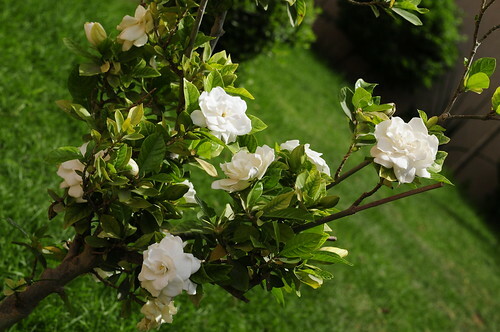 and strangely does remind me of jasmine too, strikes one as a cross between a rose and a jasmine!! :) so wonder what does it smell like for both of these have heavy heady fragrance. Aaaahhh the NIFTY FIFTY. An excellent lens, that is! Good pictures. The nifty fifty lenses are cheap because they are usually poorer build quality and use slightly cheaper optics. At least the Canon ones do; don't know much about Nikon. Thank you :) Me too. What a lovely comment from someone whose work (and generosity with knowledge) I very much admire. Thanks Andre. btw my name is Mohammad. 'Bu Yousef' means father of Yousef. We use the oldest child's name as an alias. Good memories :) Te smell is amazing. You know something, I think the smell is a sort of cross between the two too! The NIFTY fifty... not the THRIFTY fifty. It may have been less expensive, but it wasn't cheap! It is a great lens. Wainik ams ma bayant bi diwaniya? Some very nice shots! I do enjoy taking picture with lens with low f-stop! Your photographs are really great mashalla!